Orange County Mayor Teresa Jacobs recently participated in a panel discussion and luncheon titled “The Legislative Road to West Orange Prosperity,” coordinated by the West Orange Chamber of Commerce. The West Orange Chamber of Commerce builds partnerships by serving and facilitating opportunities for nearly 1,000 member businesses in the region. 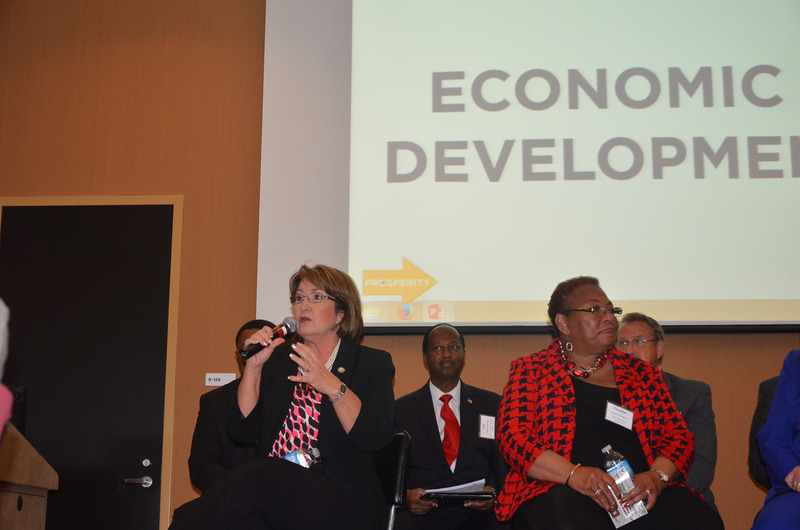 Held at Valencia College, the discussion covered a wide range of topics from economic initiatives to health issues. Panelists included District 12 Florida State Senator Geraldine Thompson, District 15 Florida State Senator Kelli Stargel, District 44 Florida Representative Eric Eisnaugle, City of Ocoee Mayor Scott Vandergrift, Town of Windermere Mayor Gary Bruhn, Town of Oakland Commissioner Joseph McMullen, City of Orlando Commissioner Sam Ings and City of Winter Garden Commissioner Bobby Olszewski. The West Orange Chamber of Commerce received the prestigious State of Florida’s Chamber of the Year award in 2009 and 2012.